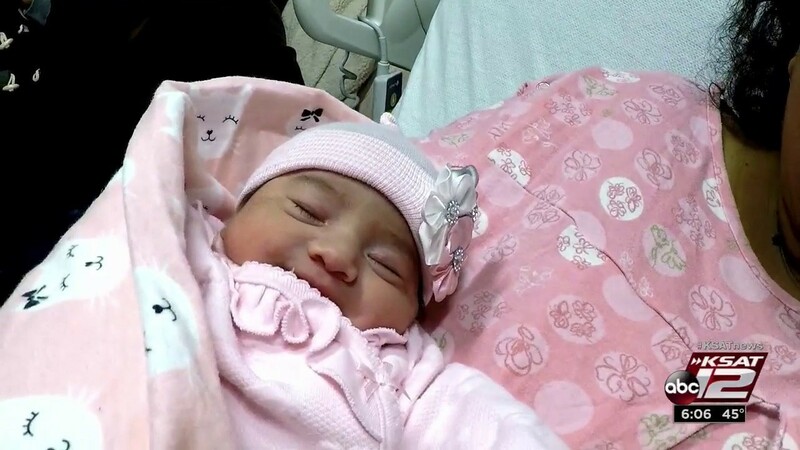 SAN ANTONIO – Marcela Perez gave birth to baby Prisca Belem Garcia Lara Tuesday at exactly 12 a.m., making Prisca the first baby born in the New Year in San Antonio. Prisca, who weighed in at 5 pounds, 13 ounces is leaving the hospital with a number of gifts, including a $10,000 scholarship to the University of the Incarnate Word. Prisca and her mother were showered with gifts at University Hospital, including an infant car seat and playpen from University Health System, a car seat booster and gift bag from Community First Health Plans, a gift basket from Baptist Health System and Brooke Army Medical Center, an infant activity center from CHRISTUS Santa Rosa Health System, a $75 Target gift card and Spurs onesie from Methodist Healthcare System and a deluxe nursery center from Southwest General Hospital. Prisca’s mother said hospital staff had told them that from the looks of it, there was a good chance her baby would be the firstborn of 2019. Perez said she was surprised that her baby arrived exactly 20 seconds after the stroke of midnight. But Javier Garcia, Prisca’s father, said it seems her brother, two-and-a-half year old Jose Javier, might be a little jealous of his baby sister. “It’s because he’s always been very attached to his mother,” he said. Garcia said even so, he’s confident Prisca’s big brother will be protective of his little sister. The couple, who moved from Washington State to San Antonio, said like all parents, they want the best for their children. Garcia said he wants to show them that someday, they can have a better career. He said before leaving Mexico more than 20 years ago, he’d earned degrees in agronomy and veterinary science. But because of his limited English, Garcia said he became a truck driver and he’s been successful at it. Now his baby daughter has a $10,000 scholarship from the University of the Incarnate Word waiting for her.